In practice, do polar molecules actually align in an electric field? We have all seen the following diagram (or similar) in our first chemistry class, depicting polar molecules aligned in an electric field. Is this just one of the half-truths of beginner chemistry or is this what really happens? I realize there will still be kinetic motion (spin, etc), but even statistically, is it possible for such a fluid/gas to have a net directional orientation throughout? "...the ions will rush to the respective electrodes and form the so-called electric double layer. Its thickness, known as Debye length, is usually quite small. As for the rest of the solution, it will be effectively shielded from the electric field." Perhaps this would be the same issue with hydrogen fluoride? Is it possible the Debye length would be longer for a polar covalent molecule like Acetonitrile or Chloromethane? If there are in fact polar molecules that exhibit this field-orientated behavior on a macro scale, what would be a way that it could be demonstrated? These are two entirely different and unrelated phenomena, to the point that you'd better unsee that other question and my answer to it, if you can. Ions are very much not like molecules. Ions are charged; molecules are not. Molecules don't form the double layer, nor do they even know what is Debye length. The electric field (though somewhat diminished, by a factor of dielectric constant) penetrates the whole volume of liquid, so all molecules feel it the same way; none is shielded. 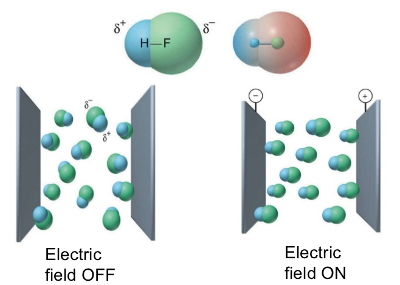 Yes, polar molecules get oriented in the electric field, albeit to a very tiny degree. Think of it this way: the molecule still bounces and rotates around, but it spends a little bit longer in the field-aligned orientation than in any other. To orient all molecules in a truly stiff way, like soldiers in formation, the energy of alignment has to overtake the energy of thermal motion, which requires enormous electric fields and is ultimately impossible, because a breakdown would occur way sooner than you get there. I believe Carnauba Wax is one material that forms Electrets. Also, polyvinylidene difluoride (PVDF) has been used. I recall the report of an experimental detonator for a torpedo that used a coil of co-axial cable rapped around the nose-cone. The cable was made with PVDF as the dielectric, and was charged as an Electret. The explosive was triggered by the charge released when the nose-cone was struck and the dielectric was distorted, changing the volume of the charge that could be contained within. I believe that Electrets are at the heart of "Swiffers" and other types of electrostatic cleaning cloths and air filters. The static fields around the fibers would attract and hold dust. Homemade Electret microphones became more popular with the Ham radio crowd, during WWII when replacement microphones became difficult to obtain. Not the answer you're looking for? Browse other questions tagged electrochemistry covalent-compounds polarity or ask your own question. Does chemistry change under high voltage? without using electronegativity, which one of these molecules is polar? Is water stream deflecting in an electric field really based on water's polarity? Can solutions of polar covalent compounds conduct electricity? When would the presence of lone pair result in a polar molecule?